March 2013 - Touch Display Research, Inc.
Today, Plastic Logic and Japan-based TOPPON Printing announced they’ll demonstrate a flexible display that is made by tiling 16 of the 10.7” flexible plastic displays. The 16 displays will be tiled together to create a 42” large flexible display. Toppan and Plastic Logic indicated, “This is the first time in the world that a flexible, reflective digital signage module over 40” in size, using organic thin-film transistors (OTFTs), has been publicly shown.”. That is true. 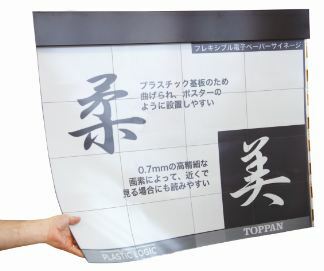 We know Toppan has demoed a 2.4 meter (which is >100 inch diagonal) size flexible E Ink displays, but that is using direct drive method, not active matrix. LG Display has demonstrated flexible E Ink displays with TFT backplane, but LG is using a-Si TFT, not OTFT. When will we see the first tiled flexible display in the market? Which company will be the first to adopt flexible display signage in the market? What will be the flexible display roadmap look like till 2015? Besides electrophoretic display, what other display technology would be made into flexible? Which other companies are developing flexible displays? The answers and more analysis can be found in our Touch and Emerging Display monthly report. This entry was posted in Displays on March 4, 2013 by jennycolegrove.